It takes a lot of chutzpah to remake a Johnnie To film, but it can be done. Swedish-born filmmaker Anders Banke got away relatively cleanly with Newsmakers, his Russian-language remake of To’s Breaking News. Perhaps To’s Drug War was a logical remake choice, because as his first Mainland gangster film, it would have far less geographical specificity—but it also happens to be a modern masterwork. It would be hard to go any darker, but director-co-screenwriter Lee Jae-young finds ways to heighten the angst and the tragedy in his Koreanized remake, Believer (trailer here), which screens during the Honolulu Museum of Art’s annual Korean Cinema series. Lee adds a number of original characters, but do not get too attached to Cha Soo-jung, Det. Won-ho’s notorious party-girl turned informant. When she is killed by the drug cartel rumored to be commanded by the unseen “Mr. Lee,” it gives him all kinds of incentive to take down the mystery kingpin. Initially, it looks like he has a potential informant when Mr. Lee’s consigliere Oh Yeon-ok survives a warehouse bombing meant to thin the ranks of the organization, but she does not last much longer than their getting-to-know-you meeting (which is a real shame, because she is quite the flamboyant villainess). Instead, Won-ho will have to make do with Seo Young-rak, a low-level dealer for the cartel, who happens to be the only face several of their most sensitive business partners know. Seo grew up in the organization when it purchased the warehouse his parents worked for. In fact, his mother still lived in the back quarters, so she also died in the explosion that also gravely injured his loyal dog. That all gives him ample reason to turn state’s evidence. With Seo’s help, Won-ho will impersonate Seo’s cartel boss Park Hae-joon in a meeting with the wildly unstable Chinese gangster Jin Ha-rim, and then play the part of Jin in a meeting with the real Park. It is a dangerous business playing two sides against each other, but the operation gets even more precarious when a highly placed Cartel player decides to assert his authority, claiming to be the real Mr. Lee. To’s Drug War did not have the Keyser Söze subplot, but it really is a neatly sinister addition. Arguably, Cha and Oh are also superfluous, but Kim Sung-ryoung is so entertainingly caustic as the latter, we would happily cast her in the lead for a Korean remake of Miss Sherlock. Alas, Cho Jin-woong suffers from comparisons to his predecessor, Sun Honglei, whose performance as the cop in Drug War was truly an epic throw-down. Likewise, the baby-faced Ryoo Joon-yeol is a pale shadow of the cold, clammy informant portrayed by Louis Koo, completely playing against type. However, Believer has the clear edge when it comes to its villains, especially the late Kim Joo-hyuk as the spectacularly unhinged Jin Ha-rim. Tragically, Kim died in a traffic accident nearly a year ago, when he was truly in his prime. Frankly, few actors could be equally credible as leading men and villainous antagonist, but he was one of them. Kim was brilliantly matched up with Jin Seo-young whose portrayal of Jin Ha-rim’s girlfriend Bo-ryeong cannot be adequately described with the words “hot” and “mess.” She has to be one of the most dangerous and alarming femme fatales you could ever imagine meeting. Nobody can compete with Kim and Jin, but Cha Seunng-won is also pretty creepy as “Brian,” the self-declared Mr. Lee (plus, Kim Sung-ryoung sure makes an impression in her limited screen time). Lee stages some lithe and lethal action scenes, but it is clear he is even more interested in the film’s betrayals and moral ambiguities. Even if you know To’s Drug War, he has plenty of new tweaks and twists up his sleeve. 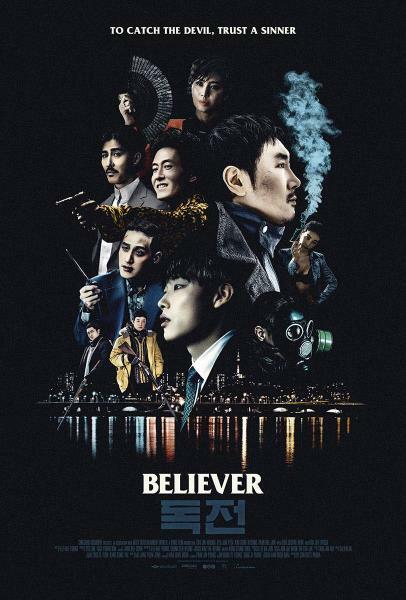 Even though Drug War is still the superior film, Believer is highly recommended in its own right, when it screens today (9/9), Tuesday (9/11), and Wednesday (9/12), as part of this year’s Korean Cinema at the Honolulu Museum of Art.